A resident of desert-scrub country, the lesser long-nosed bat is colonial, occupying mines and caves at the base of mountains where the alluvial fan supports agaves, yucca, saguaros, and organ pipe cacti. It hangs with its feet so close together it can turn nearly 360 degrees to watch for predators. Like other leaf-nosed bats, it takes flight when disturbed. When launching, it gives several strong wing beats, bringing the body into a horizontal position before releasing its grip. It is an agile flier and can fly nearly straight up while maintaining a horizontal body position. Flight is rapid and direct, but the bats can hover momentarily and maneuver well. The long tongue, covered with hair-like papillae toward the tip, is well adapted for feeding at flowers. 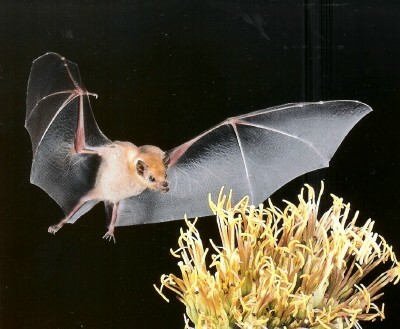 These bats may land on the flowering stalk of agaves and insert their long snouts into each blossom. After feeding, the stomach is so distended the bat appears to be in late pregnancy. When the stomach is filled, they retire to a night roost where they hang and rest. One baby is born in late May or June. Maternity colonies may harbor thousands of individuals. The subspecies occurring in the United States, L. c. yerbabuenae, is considered endangered.